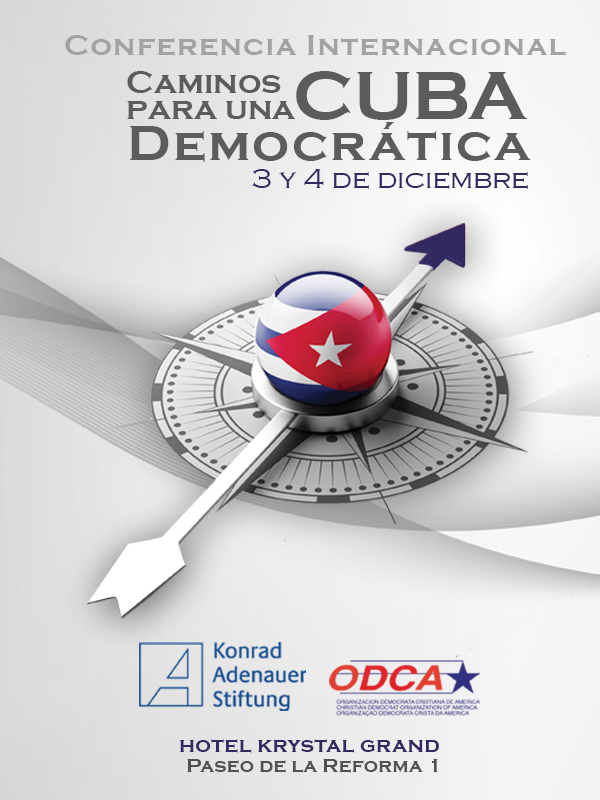 On December third at the Paths for a Democratic Cuba international conference organized by the Christian Democrat Organization of America and the Konrad Adenauer Foundation spoke on the afternoon panel "Political Opposition: Towards a unity of action and strategies for Change." Below is an abbreviated version of the presentation. Listening to the panels this morning on civil society and the political opposition led to a re-think on this presentation. But first would like to address what my colleague Andres Hernandez of the Christian Democratic Party of Cuba concerning the international situation with regards to Cuba. In 2013 a cargo ship that left Cuba bound for North Korea was discovered to be full of weapons: including rockets and MiG fighter jets hidden under bags of sugar which it tried to smuggle through the Panama Canal. Despite an investigation by the United Nations that demonstrated that the Cuban government had violated international sanctions against North Korea no action was taken. The regime in Cuba has expanded its power and influence in Venezuela, Nicaragua, Ecuador and exporting its repressive model. Meanwhile the Obama Administration has had a policy of loosening restrictions despite an American being held hostage, Alan Gross, since December 2009 and escalating high profile deaths of opposition figures beginning with Orlando Zapata Tamayo in 2010 followed by Lady in White founder Laura Inés Pollán Toledo in 2011 and Oswaldo Payá Sardiñas and Harold Cepero in 2012. Not to mention escalating violence against opposition activists including machete and knife attacks in 2013 and 2014. These are difficult times. However, lets return to this morning's focus on how to achieve change inside Cuba. Vladimiro Roca in the second panel this morning stated that there was no top down change in the island: "No change in Cuba. There are adjustments that are reversible. ...When there is change there is no regression." 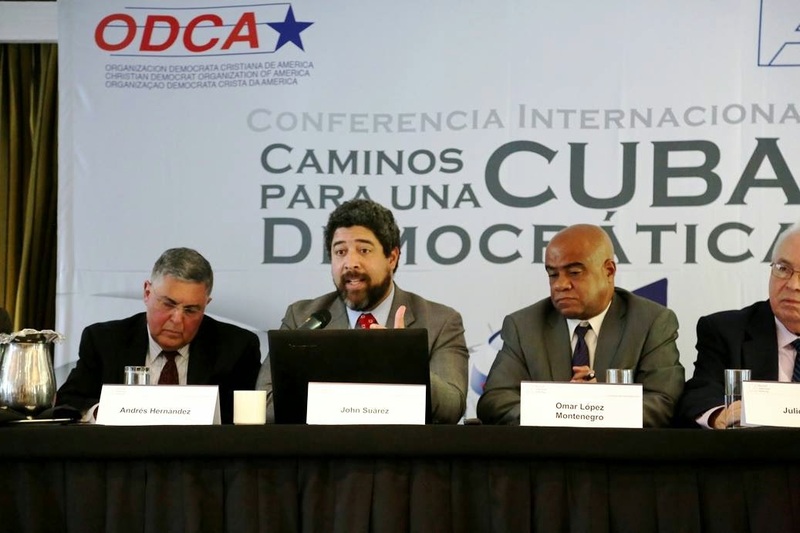 Since the founding of the Cuban Committee for Human Rights in 1976 there has existed in overall terms a general strategy of change that can be summed up as: " Carrying out a nonviolent struggle in defense of human rights for the freedom of Cuba." 1. Diagnostic: A totalitarian dictatorship with dynastic elements with the political will to hang on to power. 3. Action plan: There exist different areas of emphasis by the opposition and civil society that is also something found in nonviolent struggles. There is common agreement that the best and most effective manner to confront the totalitarian system in Cuba is with non-violence. In the second panel this morning Cuesta Morua said that "the means are as important as the ends." This brought to mind Mohandas Gandhi's observation on ends and means: "They say ‘means are after all means’. I would say ‘means are after all everything’. As the means so the end." Rolando Rodríguez Lobaina in this morning's first panel explained that "the populace is obtaining information but there are still deficiencies in the knowledge of democracy and human rights." Rolando went on to explain that "the nonviolent struggle is not sufficiently known either within the population or the resistance itself," and he also observed that there needs to be not only more struggle but more preparation. This presents a challenge because if non-violence is just a buzzword that is not understood then the reality is that the opposition may have multiple meanings on what nonviolence is but without internalizing its meaning. Unfortunately, nonviolence is often confused with passivity. 2. End repression against nonviolent organizations: this includes ending arbitrary detentions, acts of repudiation, etc. 2. Immediately issue a general amnesty for the liberation of all political prisoners, including those who have been sentenced for fictitious common crimes, and cancel the pending political causes against Cubans in exile, so as to facilitate their return to the homeland and their reintegration into the national society. 4. Recognize and protect the freedom of expression, the press, association, assembly, peaceful demonstration, profession, and religion. 6. Immediately legalize all political parties and other organizations and activities of civil society. This lists concern outcomes, the ends which everyone agrees on, but the lack of understanding of what nonviolence means both on a strategic and individual level is more problematic because it addresses the means to achieve the ends. Within academic circles there are two broad areas of nonviolent thought: strategic and principled nonviolence. Strategic nonviolence has been advocated by among others, Gene Sharp of the Albert Einstein Institute and principled nonviolence by Michael Nagler of the Metta Center for Nonviolence. Non-violent resistance is an armed struggle but its weapons are not deployed to do violence or kill. These arms are psychological, social, economic and political weapons. Gene Sharp argues with much evidence "that this is ultimately more powerful against oppression, injustice and tyranny then violence. Principled nonviolence is not merely a strategy nor the recourse of the weak, it is a positive force that does not manifest its full potential until it is adopted on principle. Often its practitioners feel that it expresses something fundamental about human nature, and who they wish to become as individuals. To adopt principled nonviolence is not a quick and easy decision one can make through logic but a slow, perhaps lifetime endeavor. Nonetheless, we focus on principled nonviolence because we think it has the potential for creating permanent, long-term change. Ultimately it can rebuild many of our institutions on a more humane and sustainable foundation. In the long run nonviolence is, as Gandhi said, an “experiment with truth.” We have all to experiment with nonviolence in the way that seems best to us, because in the end the world will need all our experiences to arrive at a new order based on nonviolence. 1. Respect everyone – including yourself. The more we respect others, the more effectively we can persuade the m to change. Never use humiliation as a tool — or accept humiliation from others ; that degrades everyone. “Injustice anywhere is a threat to justice everywhere” (Martin Luther King, Jr.) . Remember, nobody can degrade you without your permission. The real success in nonviolence , which violence can never achieve, is to heal relationships. Even in a case of extreme violence, Gandhi felt it was possible to hate the sin, not the sinner. • It enables people to break their dependency on a regime, by creating their own goods and services. You cannot get rid of an oppressor when you’re depending on him for something essential. • It’s proactive ; you are not just reacting to offenses but taking charge. This helps you shed passivity, fear, and helplessness. • It gives a movement continuity , as it can continue when direct resistance is not advisable. 4. Look for “win/win” solutions that will satisfy the real needs of all parties . Remember that you are trying to rebuild relationships , if at all possible, not score “victories.” In a conflict , we can feel that in order for one side to win, the other has to lose ; but this is a not true . Therefore, in nonviolence we do not seek to be winners, or rise over others; we seek to learn and to make things better for all. 5 . Use Power Carefully. We are conditioned (especially in the West) to think that power “grows out of the barrel of a gun.” There is indeed a kind of power that comes from threats and brute force – but it is powerless if we refuse to comply with them. There is another kind of power that comes from truth. Let us say that you have been petitioning to have an injustice removed; perhaps you have made your feelings known in polite but firm protest actions, but the other party is not responding. Then you must, as Gandhi said, “not only speak to the head but move the heart also.” And this we can do by taking upon ourselves, to make it clear, the suffering inherent in the unjust system . This is known as Satyagraha, or ‘truth force.’ In extreme cases we may have to do it at the risk of our life (which is why it is good to be very clear about our goals!). Do this with care. History, and often our own experience, has shown that even bitter hostilities can melt with this kind of persuasion that seeks to open the eyes of the opponent rather than coerce him or her. Nonetheless, there are times when we must use forms of coercion, for example, when a dictator refuses to step down, and we have to act immediately to end the vast amounts of human suffering that is caused by that person misusing power. Even then, it requires strategic thinking and nonviolent care to do it right. But when time does allow we use the power of patience and persuasion, of enduring rather than inflicting suffering. The changes brought about by persuasion are lasting: one who is persuaded stays persuaded, while someone who is coerced will be just waiting for the chance for revenge. 6 . Claim our Legacy . Nonviolence no longer needs to take place in a vacu um. To know the history of the many nonviolent movements we referred to at the beginning, and be in touch with others involved in similar efforts today, can be very helpful. Colleague on my right spoke about the nonviolent revolution in Burkina Faso, but today in Hong Kong a nonviolent movement born in 1989, in reaction to the massacre of students in Beijing in June of that year, anticipated the British handover to main land China in 1997 demanding democratic reforms and an agreement for the transfer that protected the rights and freedoms of Hong Kong residents. Since 1997 when the Chinese communist regime has sought to renege on its agreements: taking over education in order to indoctrinate Hong Kong youth; passing anti-subversion laws that would've gutted civil liberties hundreds of thousands took to the streets nonviolently with concrete demands and succeeded in stopping the power grab. Now in 2014 the announcement was made that the selection of candidates and the universal suffrage of Hong Kongers would not be respected and hundreds of thousands have taken to the streets and key areas of Hong Kong have been occupied. These are movements worth studying. Unfortunately, the temptation to embrace violence, especially after provocations with the belief that it will speed up change has been demonstrated time and time again to be a failure. For example following the Sharpesville massacre in 1960 the African National Congress abandoned its nonviolence stance and prolonged the existence of the Apartheid state for another three decades. It was not the African National Congress and the armed struggle that brought the Apartheid regime to the negotiating table but the United Democratic Front (UDF) and mass civic nonviolent action combined with international sanctions. The path to a free Cuba is to be found in the intersection of principled and strategic nonviolence.